Color was olive-green -- a holdover, I believe, of the color of US Army uniforms in the recently concluded World War 2. Seems olive-green was the Official color of most things US government-related back in those days. There are STILL olive green mailboxes, but they have no slots for mail and are used by carriers as storage while on their routes. If you remember, before they were red, white, and blue, they were olive green. I'm not that old and I remember both kinds of mailboxes. Re-read my post just now and flashbacked to three forgotten memories. The mini mail drop box attached to the corner lampost in my childhood was there for years in the days of zone numbers. 1. From babyhood being held in a parent's arms so I could drop letters in. 3. Standing on tiptoes and reaching it! "You're getting big," someone said. This was when you had to write a "Zone Number" in the address between City and State. This was before they invented zip codes. Neighborhoods also had smaller mailboxes attached to the lamp post. We had a mailbox next to the deli in our neighborhood and the kids started throwing stuff in it, some things that are too gross to mention! They finally just took it away. I believe they switched to a single color to save money. 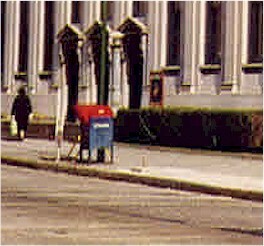 I recall when these mail boxes were painted red and blue they were also stenciled, airmail now 5 cents. Not only are they gone, but photos of them seem to be gone. (Some sort of conspiracy...?) This was one of the hardest BBeM images to locate on the Web; I must have spent days searching for it.